Extra Dessert Delights Gum Coupon! Here is a sweet reward if you buy the Extra Desserts Delights Gum! 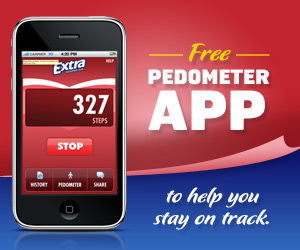 The Extra Brand is offering everyone a chance to download a free pedometer app for smart phones such as iDevices and Androids to walk off those dessert pounds, haha… No seriously, I’ve started two weeks ago doing the Beach Body Insanity Program and it Rocks, so using this app you can track the number of steps taken throughout the day. It will log workouts to help you “stick with” your healthy lifestyle goals, along with eating a little candy. 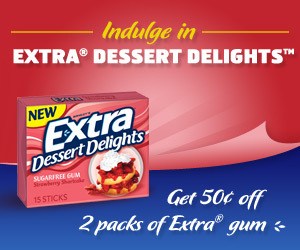 COUPON: Get some sweet savings on your next Extra Dessert Delights gum purchase!